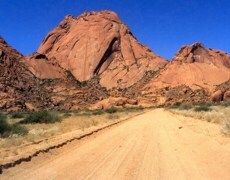 Follow the D1918 to Spitzkoppe, an inselberg in the eastern part of the Namib that is probably the best known and most famous landmark in Namibia. 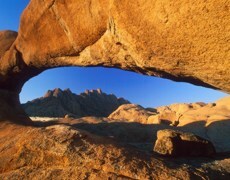 Known as the Matterhorn of Africa, the majestic form of the Spitzkoppe towers 1,784 metres above the flat surrounding plains. Fascinating rock formations, rock paintings and a wide variety of plants amidst the almost barren Namib Desert make the Spitzkoppe one of the most interesting places to visit. The trails goes in a south-westerly direction and enters the Omaruru River at Lêwater. The river forms a linear oasis and a variety of trees and plants can be seen. The skoenklip, a huge boulder in the form of a shoe, makes an interesting halfway stop. 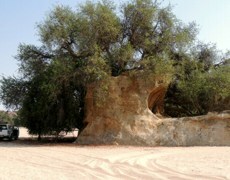 The sand in the riverbed is thick and driving difficult – make sure that you take enough fuel along. The Omdel Dam is situated in the Omaruru River where ephemeral floodwaters are temporarily stored to be released in dry seasons into infiltration areas over natural underground fresh water reservoirs. When there is water in the dam a wide variety of waterfowl and interesting plants can be seen. Don’t do this trip during the rainy season between November to April. Heavy downpours inland can cause the river to come down unexpectedly, trapping the unsuspecting traveler. The best time to undertake such a trip is during May, at the end of the rainy season.